At Sunworld Arista; discover something new every day. Let your life sail ever so smoothly, in an intensely serviced residential complex that sets new benchmark in group housing society and accessibility management. Here you would be secure with peace of mind, state of the art electronic surveillance. Find every whim and fancy delivered to you on a platter. The apartments of this project are ultra in size; hence we can say the endless room for peace and beauty – unending apartments in an unending space. 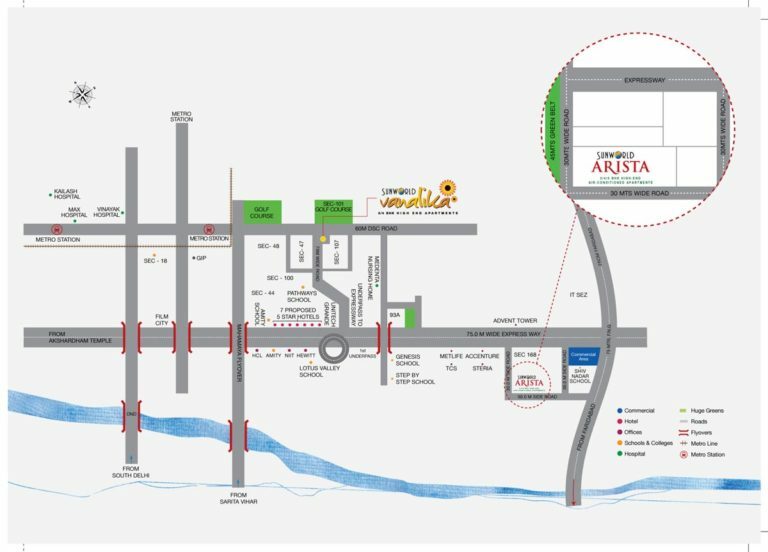 If we talk about the master layout of the Sunworld Arista, it is the best ever, as project is spread over 10 acres of land with beautifully located in two side open so it seems as L shape plot and just in front of the project a broad green belt has been developed by the Noida Development Authority and as project plot is 10 acres in which 6 acres land has been used for a central green park. Sunworld Arista, and feel like a modern day monarch. ·10 Acre two side open corner rectangular plot. ·Based on unique Green Building concept. ·Green features like rain water harvesting, AAC Blocks for energy saving, water re-treatment for landscaping and flushing. ·Proposed metro station approx. 1 Km. · Schools like Shiv Nadar School, DPS, Genesis Global etc. and MNCs like Accenture, Steria, TCS, MetLife, Samsung, KPMG etc within the radius of 2 Kms. ·Amenities like swimming pool, splash pool, club house, well equipped gymnasium, yoga /meditation area,and commercial complex within the project. ·Well designed room layout with provision for maximum no. of balconies.